Very nice, clean and easy to config template. It has a great vertical menu and nice module positions. This fashion blog Joomla template features a trendy card-based layout to present your content with flavor. On hover, each card gets subdued, thus bringing the content laid over it into focus. To navigate your resource, there is a sidebar-based menu that stays in sight while page scrolling. In addition to content categories, visitors can also access links to social media profiles in the sidebar. This responsive template comes with a grid-based portfolio, where projects can be sorted by name, date and popularity. When it comes to customization, you can change the default palette with one click only. A built-in customizer allows you to switch between various pre-made color blends. Responsive design would make your site or blog appear equally cool on display of any laptop or hand held device. Bootstrap is really a super well-liked framework, that makes the work with Html document, CSS as well as JS much less complicated. It had been designed to be a tool to develop a responsive design, nonetheless later it put in loads of extra overall performance. Bootstrap makes it possible to build up responsive, mobile-first projects extremely easily. The portfolio is a kind of an album, demonstrating examples of your work. For an indoor designer that would be photos of places he styled, for web-developer, it's a list of webpages he constructed. The portfolio is a demonstration of your expertise. Portfolio web sites come to be an increasing number of well known for modern day designers, professional photographers as well as developers. Consumers or companies might evaluate your qualifications from the first visit to your web site and fairly quickly decide if they need to work with you. Can I contact the Joomla theme for Fashion Designer author? Yes. You can contact this Joomla theme for Fashion Designer author/author's team directly using your personal account under the Support tab. Can I integrate the Fashion Trends Joomla design with third-party software or applications for development of my new products? No, you cannot get the developers license for development of Fashion Trends Joomla design or other products. Can I get the Fashion Stylist Joomla template in higher resolution to use for printing? No, we design Joomla design themes for Vintage Fashion optimized for web resolution only. How many applications, programs etc can I use to integrate with the Joomla themes for Fashion Trends under one extended license? The extended license gives you the right to use the purchased Joomla themes for Fashion Trends for the integration with one software/freeware/application/CMS/sitebuilder only. In case you would like to use the template with the other application, the other license is to be acquired. 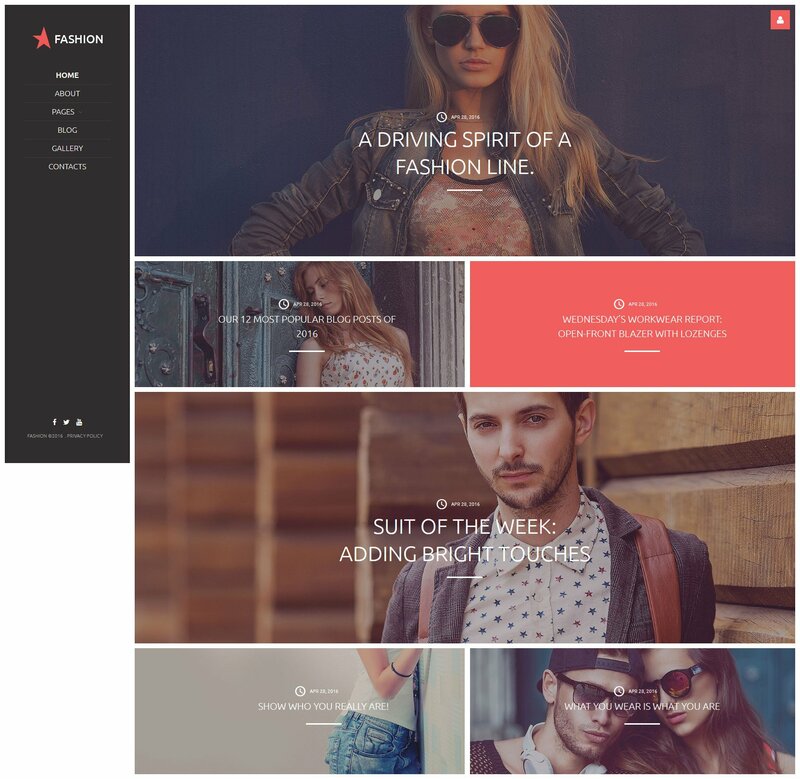 Is it possible to buy the particular image from the Fashion Joomla theme? No. According to our Terms and Conditions we never sell the images separately from Joomla templates for Retro Fashion (as well as the templates separately from the images). What am I allowed and not allowed to do with the Fashion Trends Joomla design themes? You may: Build a website using the Joomla design theme for Men Fashion in any way you like.You may not:Resell or redistribute templates (like we do).Claim intellectual or exclusive ownership to any of our products, modified or unmodified. All products are property of content providing companies and individuals.Make more than one project using the same template (you have to purchase the same template once more in order to make another project with the same design). Are there any restrictions for using imagery, cliparts and fonts from the Joomla design for Beauty I purchased? All imagery, clipart and fonts used in Joomla design for Beauty are royalty-free, if not stated otherwise on the product page, and are the integral part of our products. One Time Usage License and Developers License give you the right to use images, clipart and fonts only as a part of the website you build using your template. You can use imagery, clipart and fonts to develop one project only. Any kind of separate usage or distribution is strictly prohibited. Is it possible to reactivate my download link for Joomla template for Boys Fashion if it was deactivated after 3 days? Yes. Please re-activate the download link for Joomla template for Boys Fashion within your account under the Downloads tab or contact our billing department directly regarding that. Will TemplateMonster help me to edit my Fashion & Beauty Blog Joomla template? TemplateMonster offers you a variety of sources to help you with your Fashion & Beauty Blog Joomla template. Use our comprehensive Online Help Center to get the basic knowledge about your Fashion & Beauty Blog Joomla template. Our Knowledgebase contains customers questions and most frequent problems. Anyway, you can always use TemplateMonster 24/7 phone support, try our Ticket System or Live Support Chat to get qualified assistance from our support representatives. Are there any limitations on selling the Fashion Stylist Joomla template as the integral part of my new product? Can I get the extended license for some other pricing than the half of the initial Joomla theme for Womens Fashion price? No. The price for purchasing license for a single Joomla theme for Womens Fashion is the half of the template unique price. Can I resell the Joomla design themes for Fashion & Beauty News I bought the extended license for? No, you cannot resell the Joomla design themes for Fashion & Beauty News as is. You can only sell them as the integral part of your new product. I like the image from the Joomla design theme for Fashion Looks and would like to use it for my advertising campaign, can you send me this image in a higher resolution? No, we can't provide image in higher size or resolution rather than it is on the Joomla design theme for Fashion Looks . We recommend looking for professional images on online photo resources. What is Extended License for Joomla theme for Fashion Consultant ? Can I customize the Joomla template for Pin Up Fashion? Yes, you can customize the Joomla template for Pin Up Fashion to any extent needed. You cannot use a header of the template for one project though, and images from the template for the other project. Can I resell the Joomla design theme for Fashion Journalist as is? No, you cannot resell the Joomla design theme for Fashion Journalist as is. Make sure that these charges for Joomla template for Pin Up Fashion have different order IDs. If it is so, contact our billing department. What do I receive when I order a Joomla theme for Fashion Beauty from TemplateMonster.com? After you complete the payment via our secure form you will receive the instructions for downloading the Joomla theme for Fashion Beauty. The source files in the download package can vary based on the type of the product you have purchased.If you need unzipping software to open the .zip archive, Windows users may visit www.WinZip.com, Mac users may visit www.StuffIt.com. Siamo una web agency e da anni utilizziamo molto spesso i template forniti da Template Monster per i cms magento, joomla, prestashop e anche per dei semplici html. Sono facili da modificare e adattare alle richieste dei nostri Clienti e in caso di necessit&agrave; il supporto tecnico offerto da Template Monster risolve in maniera veloce gli eventuali problemi. Un punto di forza sono gli aggiornamenti continui alle risorse disponibili con l&#039; offerta di nuovi template continua. The installation took place smoothly, we hadn&#039;t any setbacks at this stage.